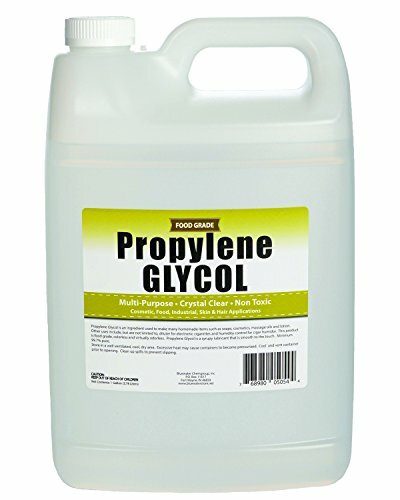 Propylene Glycol is an ingredient used to make many homemade items, some of which include soap, humidor solution, detergent, moisturizer, shampoo, massage oil, lotion, cigar juice for humidors, and RV antifreeze. Other uses include cigar juice for humidors and RV antifreeze. This product is food grade, kosher, USP, colorless and virtually odorless. Propylene Glycol is a syrupy lubricant that is smooth to the touch. One quart, minimum 99.7% pure. Store in a well ventilated, cool, dry area. Can be used as a humectant, solvent, and preservative for food. It is also used in various edible items such as coffee-based drinks, liquid sweeteners, ice cream, whipped dairy products and soda. Propylene glycol will lower the freezing point of water, so it is used as a de-icing fluid for aircrafts. Water-propylene glycol mixtures dyed pink to indicate the mixture is relatively nontoxic are sold under the name of RV or marine antifreeze. Frequently used as a substitute for ethylene glycol in low toxicity to create an environmentally friendly automotive antifreeze. It is also used to winterize the plumbing systems in vacant structures.